I’m super-excited to meet up with Joren today to talk about the sit this weekend. I couldn’t be more grateful & excited about helping guide this retreat together on Sunday. Leslie Joren Wagner is an artist who has been practicing meditation for 28 years. She took Buddhist precepts in 2009, studying for 16 years in the Soto Zen tradition of Maezumi Roshi. Leslie Joren is also a certified Reiki Master Teacher and has acted as a representative to the Buddhist Council of NY, developing community education and outreach programs such as Meditate NYC and the Buddhist Forum. She received a BFA from Parsons School of Design, receiving a 2017 Hemera Tending Spaces Fellowship. 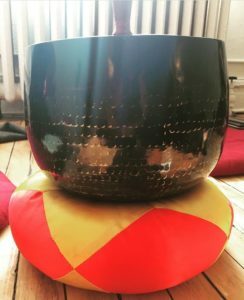 She continues to explore the connection between Art and Dharma, and considers art-making a meditative practice. To that end, she creates workshops which encourage people to blossom and share their own unique wisdom in the world. Leslie Joren is a graduate of the IDP Meditation Teacher Training and is most grateful to all of her teachers. I can’t wait to sit with this amazing woman! The Interdependence Project has additional details (including info on registration) at their site here. Facebook’s got event details too.